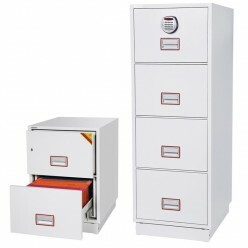 The Fire Protected Filing cabinet offers protection in a stylish lightweight cabinet. The Fire Protector Filer offers fantastic protection for your files in case of a fire. It is a stylish modern filing cabinet constructed with ultra lightweight material so does not need special supported flooring.